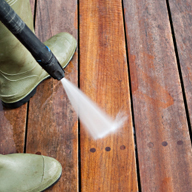 Pressure washing is a fast and effective way to clean decks, siding, driveways, and other exterior areas of your property. 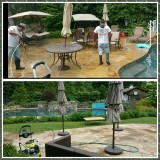 To have it done right, without the hassle and expense of renting a power washer, call Dave’s Garage Cleaning & More for professional power washing services and get the clean deck, siding, roof and driveway you want, fast! Your local Dave’s Garage Cleaning & More will arrive at your property with a pressure washer in hand, along with ladders, the right-sized hoses and any desired detergents or degreasers, and expertly power wash the areas you need cleaned, using the appropriate nozzle and pressure settings for each specific job. Dave’s Garage Cleaning & More can keep your property looking like new! The combination of our professional cleaning expertise and modern pressure washing and surface cleaning equipment consistently deliver outstanding commercial exterior cleaning results for all types of business properties. 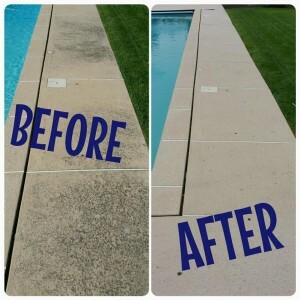 Pressure washing also makes outdoor play equipment more sanitary forthe kids, removes plants and oil stains from driveways and walkways, and acts as the perfect prep for an exterior painting or staining project.